A sweet creamy dessert, also known as a Tuscan trifle that was originally created in the Tuscan region of Italy. It has a very light texture, which is similar to whipped cream. 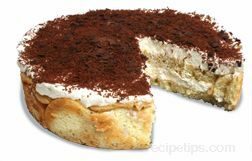 This dessert consists of ladyfingers (small finger-shaped sponge cakes) that are sprinkled with coffee or espresso and then covered with a mixture consisting of mascarpone cheese, sugar, egg yokes, and either brandy, Marsala, or rum. Shavings of chocolate or cocoa are sprinkled on the top.